The artist [1815-1860]; his wife, Jane Suddarth Toole, North Garden, Virginia, 1860; by inheritance to their daughter, Alice Toole Barnes [Mrs. Theodore Barnes], Washington, D.C.; by inheritance to her daughter, Mrs. Beulah Barnes Weaver, Washington, D.C.; by inheritance to her son, B. Woodruff Weaver, Washington, D.C.; sold 1955 to Edgar William and Bernice Chrysler Garbisch; gift 1958 to NGA. The Garbisch records contain no notation of this painting's history. It has been reconstructed through information provided by descendants (William P. Campbell, memorandum of 28 November 1955 and notes of a telephone conversation with Mrs. B. Woodruff Weaver of 16 March 1961, both in NGA curatorial files). American Primitive Paintings from the Collection of Edgar William and Bernice Chrysler Garbisch, Part II, National Gallery of Art, Washington, 1957, no. 66. 101 Masterpieces of American Painting from the Collection of E.W. and B.C. Garbisch, traveling exh. by the Amer. Federation of Arts, New York, 1961-1964, only shown at Virginia Museum of Fine Arts, Richmond, 1962, not in cat. The Artist and the Sportsman, The National Art Museum of Sport, Inc., Madison Square Garden Center Gallery of Art, New York, 1968, 78. Extended loan for use by The Supreme Court of the United States, Washington, D.C., 1971-1987. What is American in American Art, M. Knoedler and Co. [benefit exhibition for the Museum of American Folk Art], New York, 1971, no. 35. Extended loan for use in Chief Justice Rehnquist's chambers, 1986-1992. 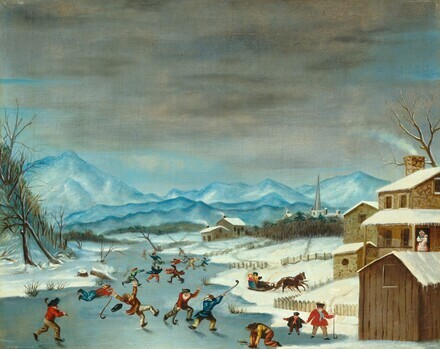 In Pursuit of Sport, Brandywine River Musuem, Chadds Ford, Pennsylvania, 1987, no cat. Extended loan for use by The Supreme Court of the United States, Washington, D.C., 1988-1992. American Paintings: An Illustrated Catalogue. National Gallery of Art, Washington, 1980: 249, repro. Rubin, Cynthia Elyce. Southern Folk Art. Birmingham, Alabama, 1985: 64, 69, 78. American Paintings: An Illustrated Catalogue. National Gallery of Art, Washington, 1992: 368, repro. Chotner, Deborah, with contributions by Julie Aronson, Sarah D. Cash, and Laurie Weitzenkorn. American Naive Paintings. The Collections of the National Gallery of Art Systematic Catalogue. Washington, D.C., 1992: 384-386, color repro. 385.